Surviving bacchanal days of over indulgence, a change is desperately needed and drunken chicken seems to be the perfect antidote to cleanse my system. Gently easing myself into another round of drinking and overeating New Year's eve celebration. Ironic I know, considering this chicken dish is intoxicated with alcohol which kind of defeat the purpose. But despite the booze-laden ingredients, this is actually a very light tasting dish and rather refreshing. 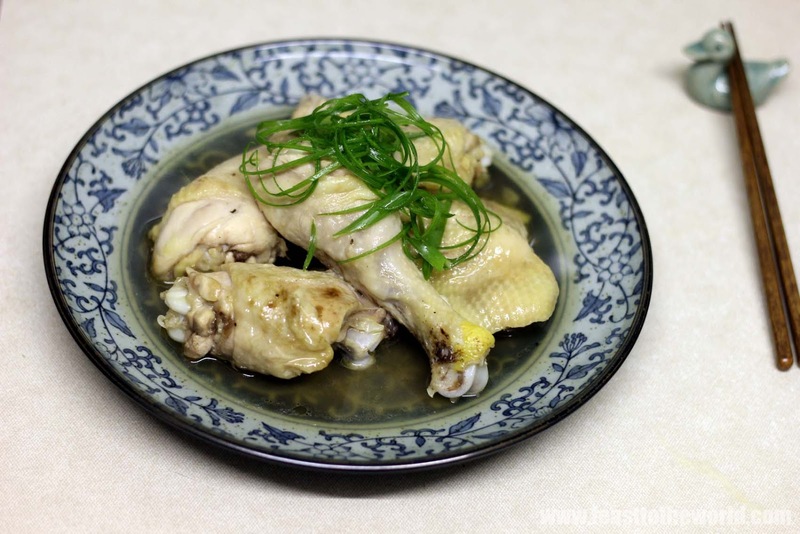 There are many variations to this classic Chinese dish. Some add medicinal herbs such as goji berries, star anise, clove etc but here I am making the dish in it's simplest form. Even without the bells and whistles, this is still a wonderful dish. The secret is the addition of the Mei Kuei Lu Chiew or the Chinese rose wine. 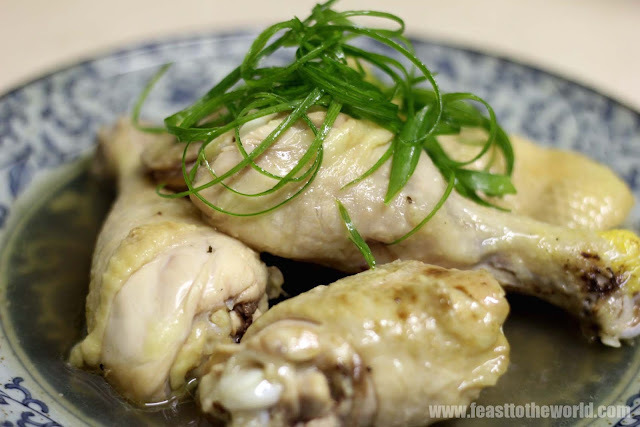 It infuses the chicken with a lovely aromatic rose fragrant and subtle sweetness. Always make the drunken chicken at least a day ahead of serving as the magic of this dish is that the longer you leave the chicken 'drunken' in the boozy broth, the richer the flavours will develop. My nan used to steeped the chicken for days before serving. And one last thing. To make sure the dish is at its best, serve it cold. Do not worry about the gelatinous broth that surround the chicken. To me, this is the best bits, especially when eaten with a bowl of fluffy steamed rice....so good! Place the chicken pieces in a dish wide enough to fit them all in one single layer. Add the rice wine, Chinese rose wine, ginger, spring onion, salt and pepper. Steam in a steamer for 35-45 minutes, until the meat is cook through. Remove from the steamer and leave to cool. Once cool, cover with a cling film or transfer to an airtight container and leave overnight in the fridge, a couple of days is even better. Serve cold or room temperature with a bowl of fluffy rice, along with the flavoursome gelatinous broth. Garnish with some shredded spring onion.